I’m new here and got a 2015 ralleye edition 2 months ago and absolutely love it. I have the lights set to auto and noticed that the fog lamp indicator is on but my car doesn’t have lamps. I’m assuming that the wiring is there with a fuse and such because why else would that indicator light be on if it wasn’t working. It appears that the harness is already there and just needs the actual lamp and bulb. 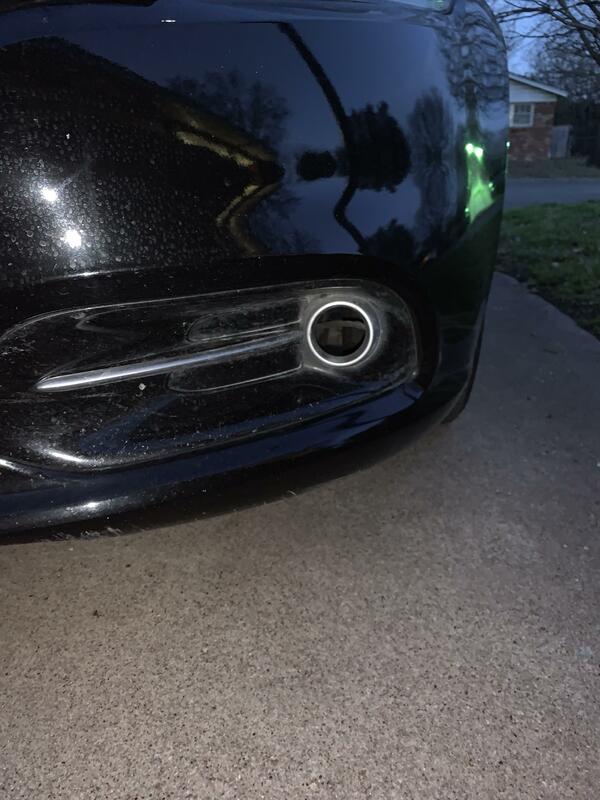 So my question is: would be as simple as installing a fog lamp and connecting wires or is there more to it? Are you saying the bulbs are missing or that there are no fog lamp housings in the bumper cover? If the housings are not there, the previous owner may have removed them to sell them. The message is there because the BCM thinks they are there. A PROXI configuration should take the message away. Adding fog lamps depends on whether the wiring is there. Contains both harnesses (68185190AA BCM to Foglamp, and 68089492AA), manual light switch, bezels, lamp holders/lamps, cable ties, and multi-lingual destructions. There may still be an Auto light version (this one has the manual light switch), I haven't looked. The fog lights are about the only thing in the Dart that appear to be outside the CANbus system. They aren't monitored, and there's no message when they go out. I think the OP means that the indicator light on the dash that the fog lights are on is coming on but there are no actual fog lights. The fog lamps are controlled by the BCM. The fog lights do not have a fault sense wire like almost every other lamp which I did not realize. The OP can check the build sheet to see if the fog lights were put on at the factory. It could be the car was in an accident and the fog lights were not reinstalled because they seem to be discontinued. Or the previous owner tried to put them in with the kit and never could get the wiring right and gave up. Lots of possibilities why the correct headlamp switch is there but the fog lights are not. There are some kits still out there but AllMoparParts list them as discontinued. Looks like the lamp socket and bulb are missing. The bumper that doesn't have fogs doesn't have the lens. You need to start scouring the junk yards in your area. Most Darts I see at junkyards have wrecked front ends so you have to be really lucky. Factory Fog Lamps not working. Help!! !